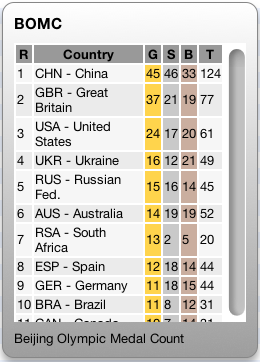 Seeing at the Paralympic are now on I have updated the BOMC widget to display their medal results. I’m in the process of rewriting the backend of the widget (seeing as this is an experiment of using JQuery in Widgets), but thought you might like it now. So here is the existing code set to display results for the Paralympics. Got listed on Apple on the last day of the Paralympics. But the listing in MacUpdate was removed, even from the backend, and I have no responce to my correspondence about why. This entry was posted in Mac and tagged Dashboard, JQuery, Macintosh, widget. Bookmark the permalink.